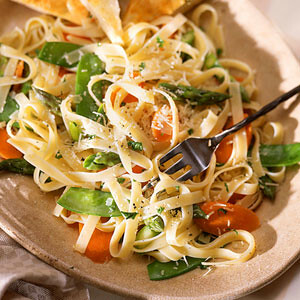 Pasta Primavera as the name suggests in a fresh take on pasta served with vegetables of the season. Some recipes call for a creamy sauce but the Primavera may also be prepared without. To do a No-cream Pasta Primavera you will need 1 package penne pasta, 1 yellow squash, chopped 1 zucchini, chopped 1 carrot, julienned 1/2 red bell pepper, julienned 1/2 pint grape tomatoes, 1 cup fresh green beans, cut into pieces, 5 spears asparagus, cut into pieces, 1/4 cup olive oil, salt, coarsely ground black pepper, and lemon juice, 1 tablespoon Italian seasoning, butter, 1 large yellow onion, 2 cloves garlic, 1/3 cup chopped fresh basil leaves, 1/3 cup chopped fresh parsley, 3 tablespoons balsamic vinegar, and 1/2 cup grated Romano cheese. To prepare, cook the pasta in a pot of lightly salted water. Add a few drops of olive oil to the water to prevent sticking. In a bowl, toss the squash, zucchini, carrot, bell pepper, tomatoes, green beans, asparagus, olive oil, salt, pepper, lemon juice, and Italian seasoning and bake in a preheated oven for 15 minutes until tender. Use the remaining oil and butter and cook with the onions and garlic in a large skillet until hot. Remove from the fire and place in a large bowl. Toss with eh vegetables and add Romano cheese to taste.